289 Marlborough is located on the north side of Marlborough, between Fairfield and Gloucester, with 287 Marlborough to the east and 291 Marlborough to the west. 289 Marlborough was designed and built ca. 1871 by Frederick B. Pope for speculative sale, one of eight contiguous houses (285-287-289-291-293-295-297-299 Marlborough) built at about the same time. The eight houses were built on a 168 foot wide parcel of land which Frederick Pope assembled from three lots, all of which originally were part of one of several larger parcels originally purchased from the Boston Water Power Company on January 29, 1866, by a real estate investment trust formed by John Templeman Coolidge, Franklin Evans, and Charles Henry Parker. Frederick Pope first purchased the eastern 100 feet directly from the trust on November 19, 1870. He bought the remaining 68 feet in two lots on October 17, 1871, from the estate of Sidney Homer, a 24 foot lot and a 44 foot lot, part of the land Sidney Homer had purchased on June 1, 1869, from J. Templeman Coolidge, Jr., who had purchased it from the trust on April 20, 1866. Click here for an index to the deeds for 289 Marlborough. On March 27, 1871, 289 Marlborough was purchased from Frederick Pope by paper manufacturer John Dixwell Thompson. On the same day, he also purchased 287 Marlborough, which he made his home. He previously lived at 28 West Cedar. On October 21, 1871, 289 Marlborough was purchased from J. Dixwell Thompson by Sophia Harrison (Mifflin) Gardiner, the widow of architect Edward Carey Gardiner. 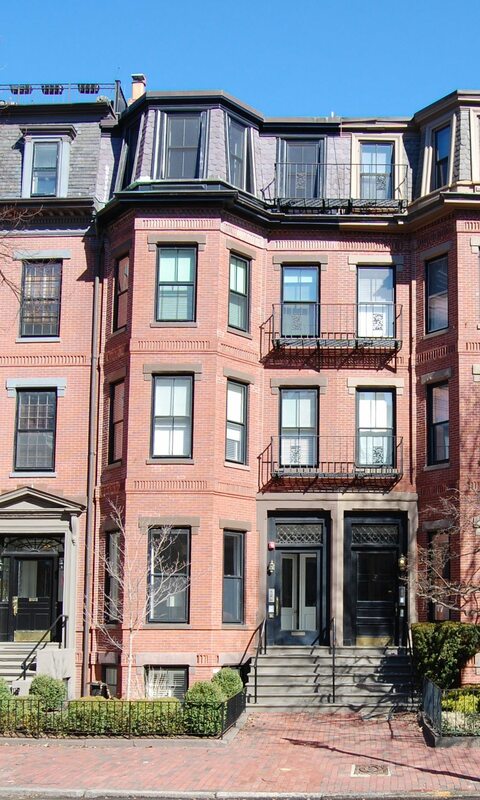 She previously lived at 5 Boylston Place. Sophia Gardiner was living elsewhere during the 1882-1883 winter season and 289 Marlborough was the home of merchant William Simes and his wife Fannie Swett (Newell) Simes. They had married in February of 1882; prior to their marriage, he had lived at the Hotel Albion at 1 Beacon. By the next season, the Simeses had moved to a new home they had built at 257 Marlborough. Sophia Gardiner resumed living at 289 Marlborough and continued to live there until her death in January of 1889. On June 3/4, 1889, 289 Marlborough was purchased from Sophia Gardiner’s heirs by attorney Alexander Strong Wheeler. He and his wife, Augusta (Hurd) Wheeler, lived at 72 Marlborough. 289 Marlborough became the home of the Wheelers’ son and daughter-in-law, Henry Wheeler and Ellen (Hayward) Wheeler. They had married in October of 1888, after which they had lived at The Copley at 18 Huntington. Prior their marriage, he had lived at 72 Marlborough with his parents. Henry Wheeler was an attorney in partnership with his father. Henry and Ellen Wheeler continued to live at 289 Marlborough during the 1905-1906 winter season, but moved thereafter to 183 Marlborough. On June 28, 1906, 289 Marlborough was purchased from Alexander Wheeler by Edith Value (Stackpole) Parker, the wife of architect John Harleston Parker. They previously had lived at 18 Fairfield. In November of 1917, J. Harleston Parker purchased 173 Commonwealth and had it rebuilt to his design. They continued to live at 289 Marlborough until the rebuilding of 173 Commonwealth was completed. On June 11, 1918, 289 Marlborough was purchased from Edith Parker by attorney Robert Homans. He and his wife, Abigail (Adams) Homans, made it their home. They previously had lived at 33 Brimmer. They also maintained a home in Marblehead. They continued to live at 289 Marlborough in 1927, but had moved to 33 Chestnut by 1928. He continued to own 289 Marlborough. By the 1927-1928 winter season, 289 Marlborough was the home of Robert Homans’s unmarried sisters, Katharine Amory Homans and Marian Jackson Homans. They previously had lived at 11 Lime. During the 1933-1934 season, Katharine and Marian Homans were living in Ponkapoag (Canton), Massachusetts, and 289 Marlborough was the home of Henry Bryant Bigelow and his wife, Elizabeth Perkins (Shattuck) Bigelow. They had lived at 230 Commonwealth earlier in 1933; their usual residence was in Concord, Massachusetts. Henry Bigelow was a professor of zoology at Harvard, where he also was curator of oceanography at the Museum of Comparative Zoology. He was a founder of the Woods Hole Oceanographic Institution in in 1930 and served as its first director. Robert Homans died in April of 1934 and 289 Marlborough was inherited by his wife. By the 1934-1935 winter season, Katharine and Marian Homans were once again living at 289 Marlborough. They continued to live there until about 1947. In 1948, 289 Marlborough was the home of Robert and Abigail Homans’s son-in-law and daughter, attorney Henry Lowell Mason, Jr., and Fanny Crowninshield (Homans) Warren Mason. They previously had lived in an apartment at 7 Exeter. They were joined by Henry Mason’s widowed father, Henry Lowell Mason, Sr.; he previously had lived at 67 Bay State Road. He was the retired president of the Mason and Hamlin Piano Company (founded by his father) and the American Piano Company. He also was an author of historical works about the piano and organ. By 1949, they all had moved to 79 Marlborough. On September 22, 1948, 289 Marlborough was purchased from Abigail Homans by Dorothy (MacLure) Leonard Wilson, the widow of Wallace Minot Leonard and the former wife of Steven Bayard Wilson, and her son, Wallace Minot Leonard. They previously had lived in Newton. They continued to live at 289 Marlborough until about 1951. On January 3, 1951, 289 Marlborough was acquired from Dorothy Wilson and Wallace Leonard by Stanley Glidden Chamberlain and his wife, Esther Carolyn (Nice) Chamberlain. They previously had lived at 17 Chestnut. He was an executive with his family’s wholesale meat company, Chamberlain & Co.
On June 23, 1952, 289 Marlborough was purchased from the Chamberlains by Sydney Reuben Barrow, a shoe dealer, and his wife, Josephine (Hanratty) Barrow. They lived at 363 Beacon. The Barrows converted 289 Marlborough into eight apartments. In December of 1952, they were cited for failure to provide adequate egress and they filed for (and subsequently received) permission to install fire escapes to address the violation. On May 25, 1954, 289 Marlborough was purchased from the Barrows by Russell J. Mulhern and Alphonse A. Kontrimas, and on May 28, 1954, they transferred the property to Russell Mulhern’s company, Boston Properties, Inc. In August of 1955, Sydney and Josephine Barrow acquired 291 Marlborough and moved there from 363 Beacon. 289 Marlborough changed hands and on September 5, 1962, was acquired by by Herbert C. Graves. In January of 1963, he filed for permission to legalize the occupancy as nine apartments, noting that an apartment on first floor had been subdivided into two apartments prior to the time he purchased the property. His application was denied and he appears not to have appealed the denial. January 12, 1963, 289 Marlborough was acquired from Herbert Graves by James F. Draper. In June of 1966, he filed for permission to legalize the occupancy as nine units. He subsequently abandoned the application. On August 11, 1966, 289 Marlborough was acquired from James Draper by Miss Florence Beth Pockwinse. 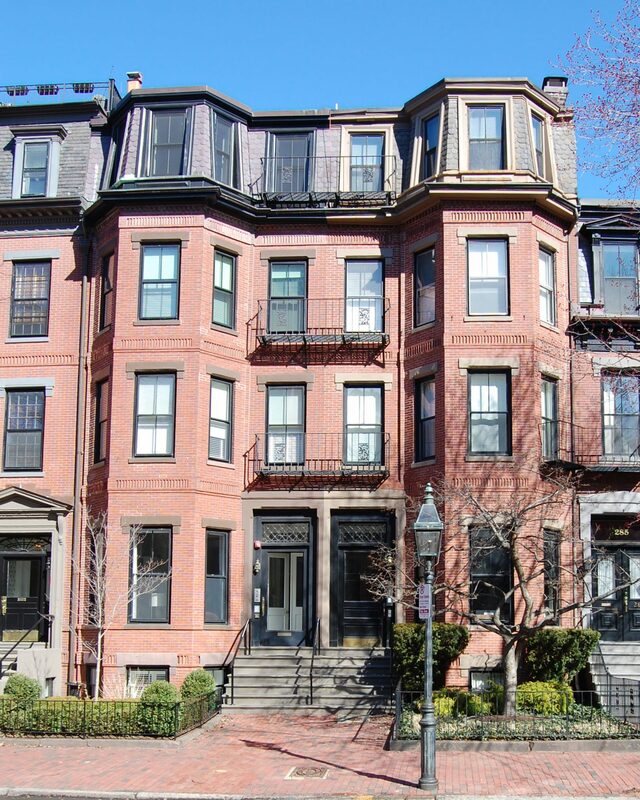 She lived at 31 Brimmer and owned several other properties in the Back Bay, most of which she operated as lodging houses. In February of 1973, she was cited by the Building Department for failing to repair fire damage to the second floor apartment in the rear, and also for failure to secure a permit establishing the legal occupancy as nine units. In March of 1973, she filed for permission to legalize the occupancy as nine units. She subsequently abandoned the application. On May 21, 1973, 289 Marlborough was acquired from Florence Beth Pockwinse by James C. Lawless and his wife, Christina H. Lawless, trustees of the Downey Realty Trust. On November 13, 1979, 289 Marlborough was purchased from James and Christina Lawless by Thomas C. Duffly and his wife, Frances (Lessin) Duffly. In October of 1979, prior to taking title to the house, the Dufflys filed for (and subsequently received) permission to remodel it and establish the legal occupancy as four apartments. In January of 1994, they applied for (and subsequently received) permission to reduce the number of units from four to three. 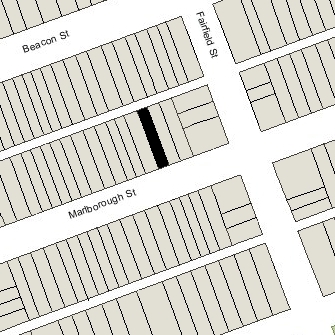 On May 1, 2012, 289 Marlborough was purchased from the Dufflys by the 289 Marlborough Street LLC (Kathryn Gledhill-Earls, manager of record). On December 27, 2012, it converted the property into two condominium units, the Residences at 289 Condominium.